If I told you I could eat broccoli with dinner every night, you might think I was exaggerating. 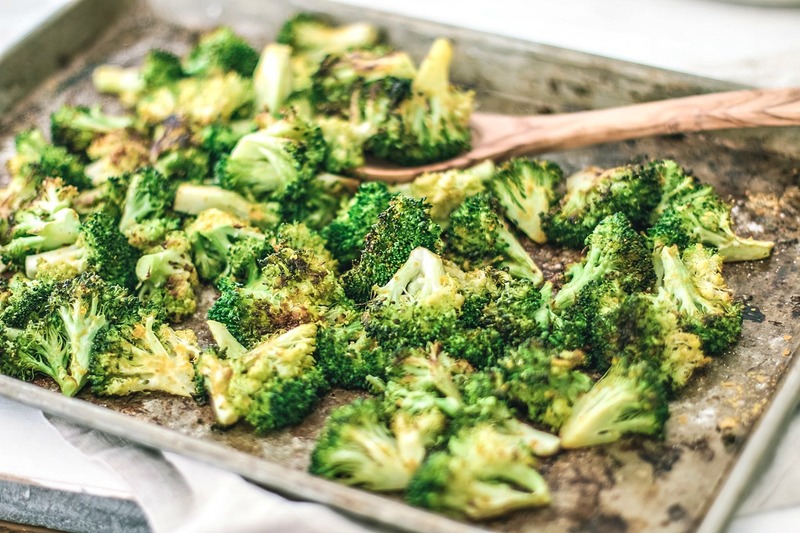 But then I’d tell you to make some of this garlicky oven-roasted broccoli with nutritional yeast for yourself and you’d see; you’d see that I’m not being absurd after all. It’s salty, cheesy, and savory. It’s simple. And it’s everything I want in a veg side without the need to drizzle a questionable amount of cheese sauce over it which is great, because right now life is hectic, and when life is hectic I turn to all things cheese. Last week was spent preparing for the worst of Hurricane Florence. As the news spent days dropping the words “Category 5” and “catastrophic” on us, all we could really do is sit. And anxiously wait. It was difficult to motivate ourselves to get any work or packing done because we were so on edge. Would we lose power? Would we be affected by the flooding? Now we’re rushing to get ready for our move and I’m scrambling to get work done. On a very screwed up sleeping schedule, to boot! So you’re getting a simple side dish of broccoli today. But! It’s awesome broccoli. It’s broccoli that I should’ve introduced you lovely people to a long time ago. Oven-roasted broccoli with nutritional yeast. When I started roasting broccoli years ago, I would slice up fresh garlic and toss it into a bowl with some olive oil, broccoli, and a pinch of salt and pepper. The idea of roasted garlic is just incredibly alluring. The problem is that garlic browns very quickly, which leaves an unpleasant and bitter taste. When you roast a head of garlic in the oven, you roast it low and slow, covered in its own skin and well lubricated with oil. But when it’s peeled, sliced, and tossed into a dish, that changes things. I stubbornly used fresh garlic for a long time thinking that moving over to garlic salt would be blasphemous, but I’ve swallowed my pride. I now shamelessly opt for a few sprinkles of garlic salt. With recipes in general, fresh garlic is my go-to. But there are always exceptions and this is one of them. The result is a garlicky, savory, and cheesy flavor. So. About that cheesy flavor. If you enjoy cooking at home and find yourself dabbling in plant-based recipes, you’ve probably heard of nutritional yeast. Its cheesy, nutty, and creamy flavor makes it a popular condiment among vegans and vegetarians—but everyone can benefit. These golden flakes are a significant source of some B-complex vitamins and they contain trace amounts of various other vitamins and minerals making nutritional yeast a smart dairy-free alternative to cheese. I’m not saying it substitutes cheese in all cases; I’d never sub nutritional yeast for cheese in mac, pizza, or other dishes that require cheese in its truest form. But in some sauces, soups, dips, eggs, and veg sides, it works like a damn charm. TL;DR: Get ready to crave broccoli. Say hello to your new favorite veggie side! This cheesy, garlicky, and savory oven-roasted broccoli will have you craving broccoli on the reg. Pre-heat oven to 425° F.
Cut broccoli down into bite-sized florets. In a colander, rinse them off and give them a good shake to dry them off; transfer them to a large bowl. Drizzle the florets with the olive oil and sprinkle the florets with 2 TBSP of nutritional yeast, followed by the garlic salt. With a large spoon, give the broccoli a good toss in order to evenly coat the florets. You could also cover the bowl and shake the contents until evenly coated. When done, spread the florets out onto a baking sheet. Sprinkle the rest of the nutritional yeast over the broccoli florets. Bake in the oven for 15-20 minutes, tossing the broccoli halfway through. Season with a bit of extra garlic salt if needed, and cracked black pepper if desired. A great recipe! My husband says roasted broccoli is better than candy! So simple yet SO delicious ! Thanks for sharing. Thinking of adding a squeeze of lemon to top it off. But it’s great as is. I LOVE roasted broccoli and could absolutely eat it multiple times a week with dinner. (I've also been known to snack on it right off of the pan, which is both delicious and bad, because then I've eaten my dinner side before dinner is even made! haha.) I haven't made it with nutritional yeast before, but I've heard that it gives a wonderfully cheesy and nutty flavor to dishes. Can't wait to try it! We do love roasting vegetables and especially broccoli. They taste so much better having spent spent time in the oven. The flavor becomes more intense. I haven't had nutritional yeast in the house for a long time. I did forget about the cheesy flavor. It would be great to have on hand. Thank you for the reminder. I'm with you in the "could eat broccoli every day" camp. I haven't tried it roasted with nutritional yeast. Great idea, and I can't wait to try it. Looks delish. Thanks. I love roasted veggies, and substituting the garlic salt for the fresh garlic is genius. No more bitter burnt garlic for me! I'm really intrigued with the nutritional yeast, and am excited to try it! We love roasted broccoli!! And I haven't tried it with nutritional yeast yet, but I should. YUM. Also, I'm glad you're okay and that Florence seems to have missed you!! Growing up, I was a very picky child. I refused to eat a lot of greens and one of the only ones I'd eat was broccoli. So I totally feel you when you say you can eat broccoli every day! I never tried making it with nutritional yeast before - I've only tried nutritional yeast on popcorn so this one is new to me! I can't wait to try it! I actually have a package of nutritional yeast in my pantry right now -- and I've never used it because I wasn't sure what to do with it. This broccoli is happening tonight. Like you, I always opted for fresh garlic over garlic salt, but you're so right.. it browns and turns bitter in the oven. How did I not put 2 + 2 together before this? There was a hysterical video on Facebook about having broccoli for dinner. My kids and I have been singing it for days. I'm still trying to convince them roasted broccoli is amazing, but in the meantime, more for me! I need to try it with nutritional yeast! I love roasting veggies...other than grilling. Love how intense and flavourful they become. I do have some nutritional yeast...I will have to give this a try. Sounds like a delicious side to and meal.